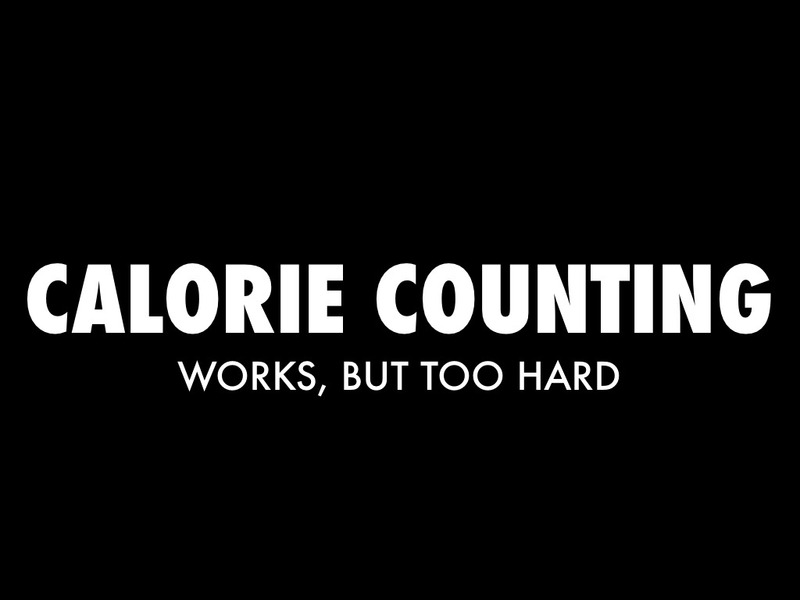 I used a calorie counting app for a while and lost nine pounds. It was great, but then I stopped and gained five pounds. Tedious: It find it too effortful and sometimes frustrating to carefully analyze my food (ex., Is this a *small* apple or a *medium* apple? How much oil is on these roasted vegetables?) and look it up in a database. Time consuming: I honestly don't want to spend any more time doing this than I have to. 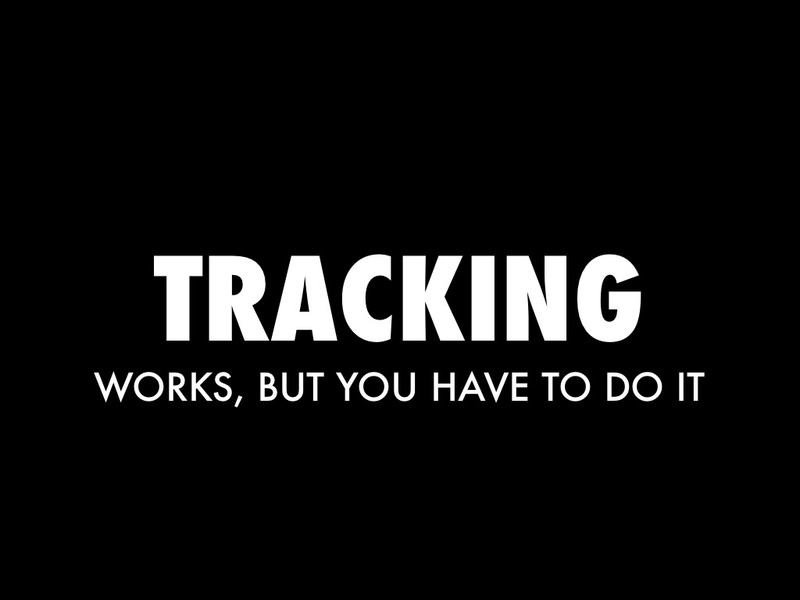 The more time it takes, the easier it is to procrastinate or just skip tracking my food. Plateau: I stopped losing weight at around 175 lbs. This was very discouraging. 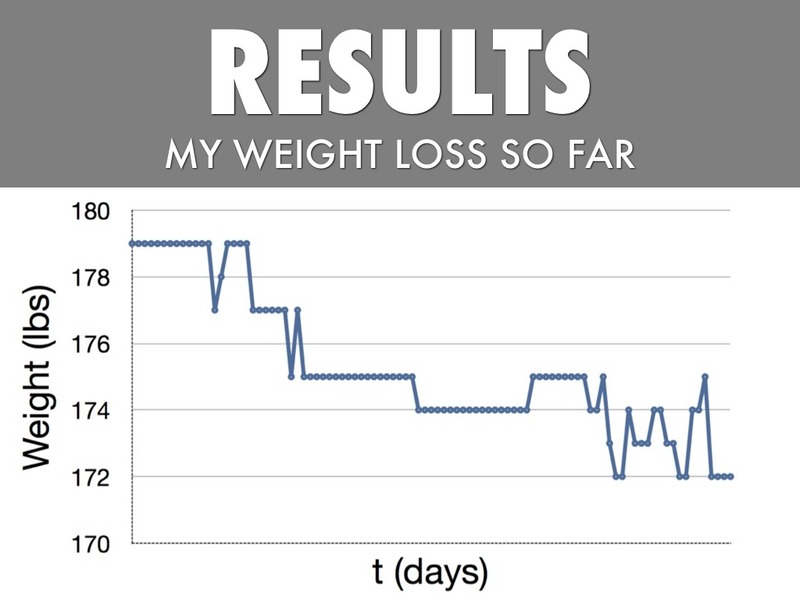 It took an average of 14.7 days to lose a pound. I didn't actually weigh myself every day. The plot gets more volatile toward the end because I weighed myself more frequently during that time. I plateaued again around 175 lbs, but I stuck with the tracking and eventually began losing weight again. US adults may be more successful at sustaining weight loss than previously thought. Long-term weight-loss maintenance: a meta-analysis of US studies, Anderson JW, Konz EC, Frederich RC, Wood CL. Five years after completing structured weight-loss programs, the average individual maintained a weight loss of >3 kg and a reduced weight of >3% of initial body weight. 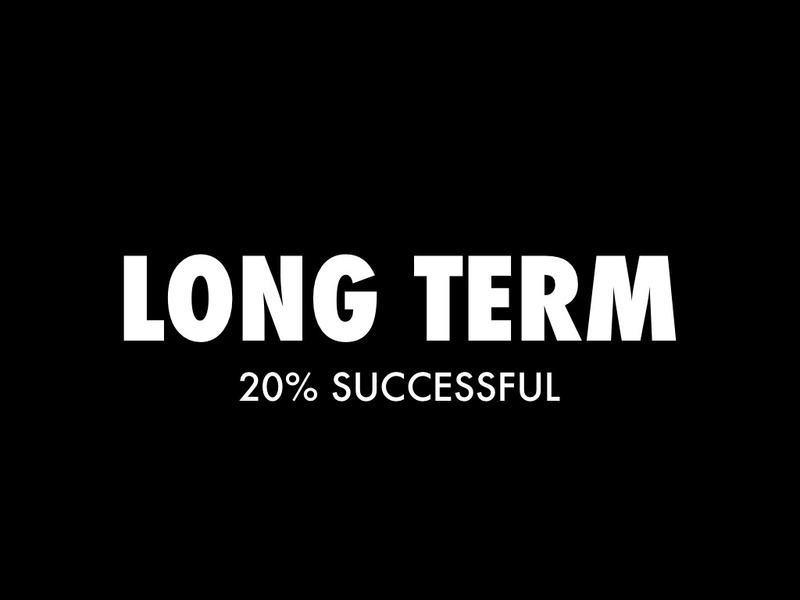 "≈20% of overweight individuals are successful at long-term weight loss when defined as losing at least 10% of initial body weight and maintaining the loss for at least 1 y"
Limit calories. It doesn't matter (for the purpose of weight loss) which foods you eat. 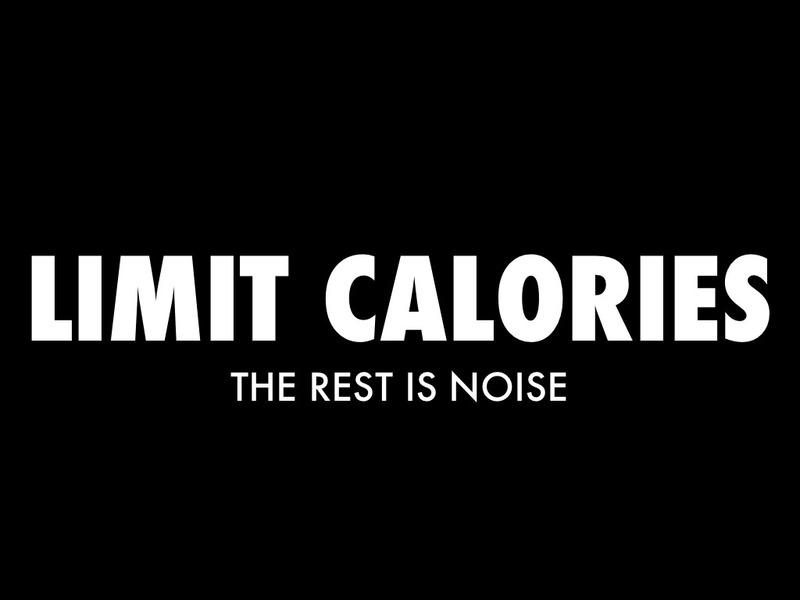 Sometimes this is said as "A calorie is a calorie." Comparison of Weight-Loss Diets with Different Compositions of Fat, Protein, and Carbohydrates, Frank M. Sacks, M.D., George A. Bray, M.D., [...], and Donald A. Williamson, Ph.D.: "Reduced-calorie diets result in clinically meaningful weight loss regardless of which macronutrients they emphasize." 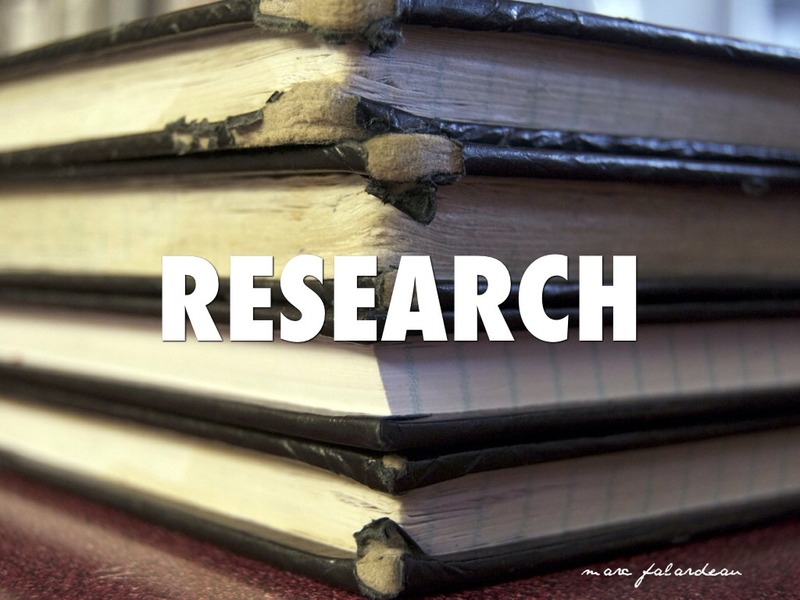 "Writing down daily intake has been shown to have a significant effect on the success of a weight loss diet and continued weight loss maintenance (Klem, 1997; Tate, 2001; Wing, 2005)." "The authors concluded that self- monitoring of diet and physical activity is predictive of weight control outcomes and suggested that future studies should focus on innovative ways to increase adherence to self-monitoring (Jelalian et al., 2010)." "There was a significant correlation between number of days recorded and weight change at four and eight weeks (P = .038), regardless of which method of self-monitoring was used." "Figure 4 illustrates the greater estimated impact of keeping more food records on weight loss for non–African Americans than for African Americans, regardless of gender." 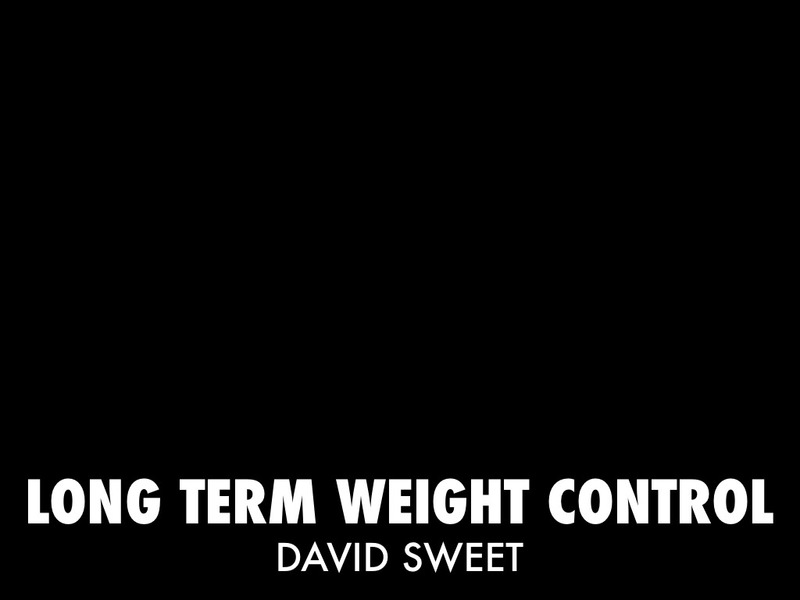 Are smaller weight losses or more achievable weight loss goals better in the long term for obese patients? Jeffery RW, Wing RR, Mayer RR. "Weight loss goals did not predict short-term or long-term weight loss." "Results suggest that lack of realism in weight loss goals is not important enough to justify counseling people to accept lower weight loss goals when trying to lose weight." 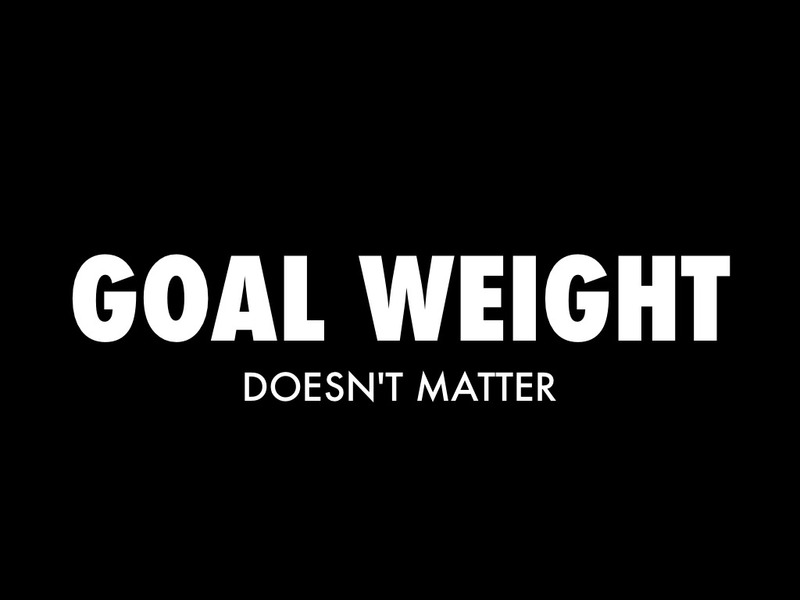 My Conclusion: Don't bother having a goal. 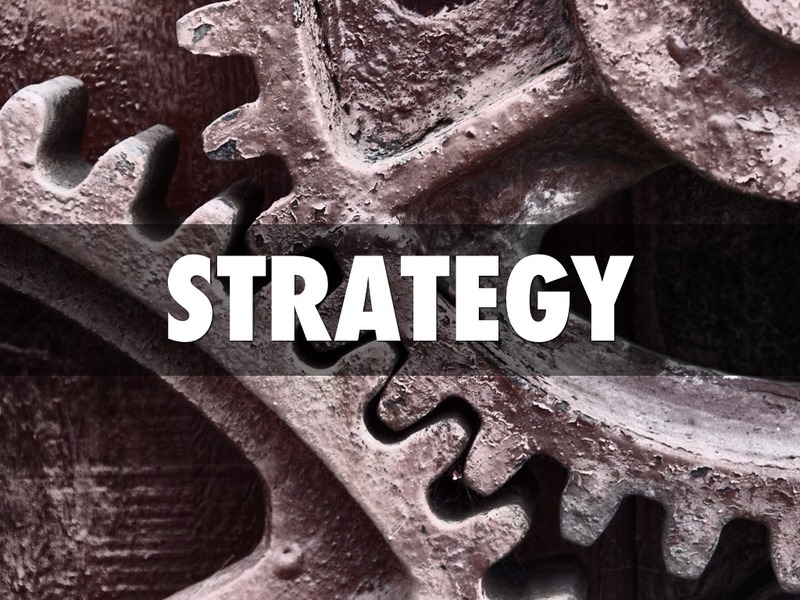 This simplifies use a bit since you don't need to decide on a goal, enter it into an app, or determine whether you've reached the goal. There are multiple ways in which either the estimate of calories required to maintain your weight or the estimate of how many calories you've consumed or expended can be persistently biased by an unknown amount. If you maintain a positive (negative) net calorie bias, you'll gain (lose) weight. 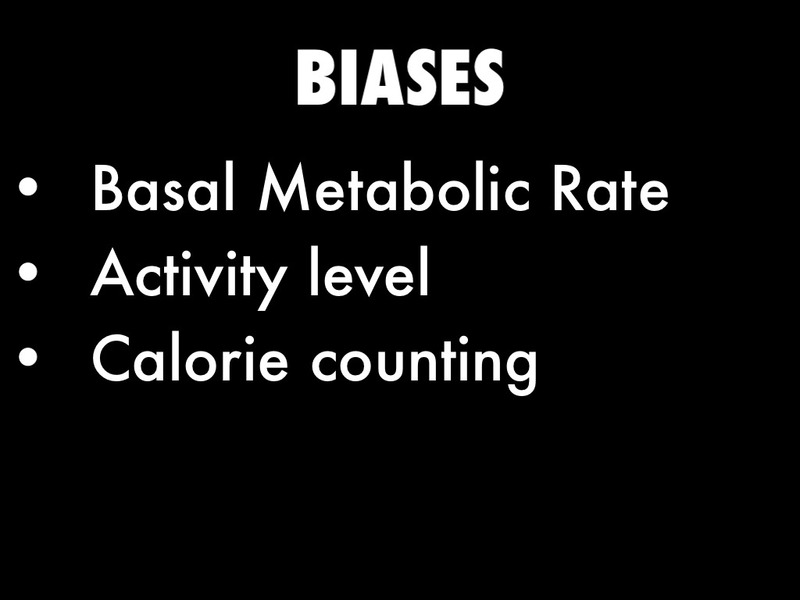 If you can't know the net bias (due to the unknown biases listed below) you can't predict whether you'll gain or lose weight. "By definition, the estimate would be expected to underestimate the true energy expenditure 50 percent of the time and to overestimate it 50 percent of the time, leading to corresponding changes in body weight. " "Sedentary means a lifestyle that includes only the light physical activity associated with typical day-to-day life. Moderately active means a lifestyle that includes physical activity equivalent to walking about 1.5 to 3 miles per day at 3 to 4 miles per hour, in addition to the light physical activity associated with typical day-to-day life. Active means a lifestyle that includes physical activity equivalent to walking more than 3 miles per day at 3 to 4 miles per hour, in addition to the light physical activity associated with typical day-to-day life." "most individuals significantly under- estimate the caloric content of restaurant food, espe- cially for higher-caloric foods." "comparisons have been made in nine recent studies, and considerable inaccuracy in self-reports of energy intake has been documented. Reported intakes tend to be lower than expenditure and thus are often underestimates of true habitual energy intake"
Validity of self-reported energy intake in lean and obese young women, using two nutrient databases, compared with total energy expenditure assessed by doubly labeled water. Weber JL, Reid PM, Greaves KA, DeLany JP, Stanford VA, Going SB, Howell WH, Houtkooper LB. "Both physically active lean and sedentary obese women under-reported TEI regardless of database ..."
I estimate volume by comparing each food item I eat to the size of my fist. For every fist-sized volume (FSV) of food I eat, I add one to a counter. The counter starts at zero each day. Let's call day t's total count F(t). 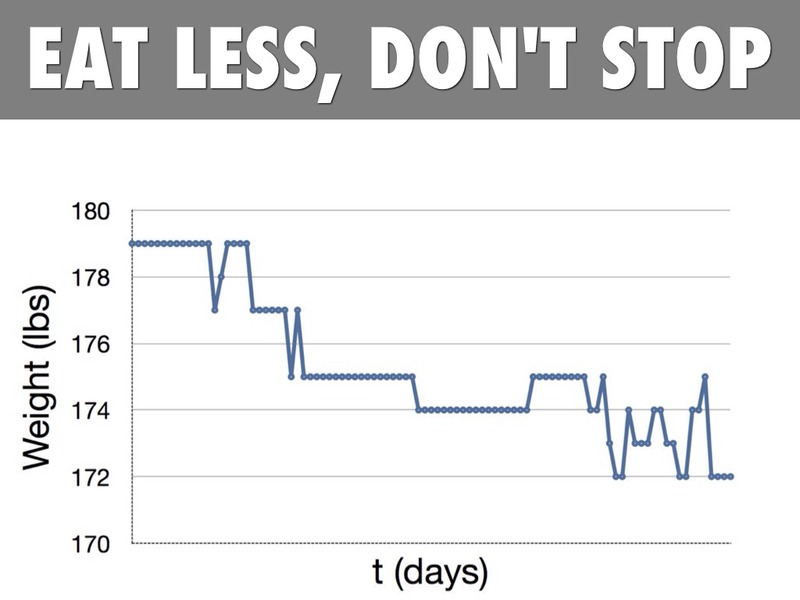 I compute a two-week moving average of F(t), M(F(t)), and try to eat fewer than M(F(t-1)) fist-sized volumes on day t.
In short: I eat a little less than I've been eating. 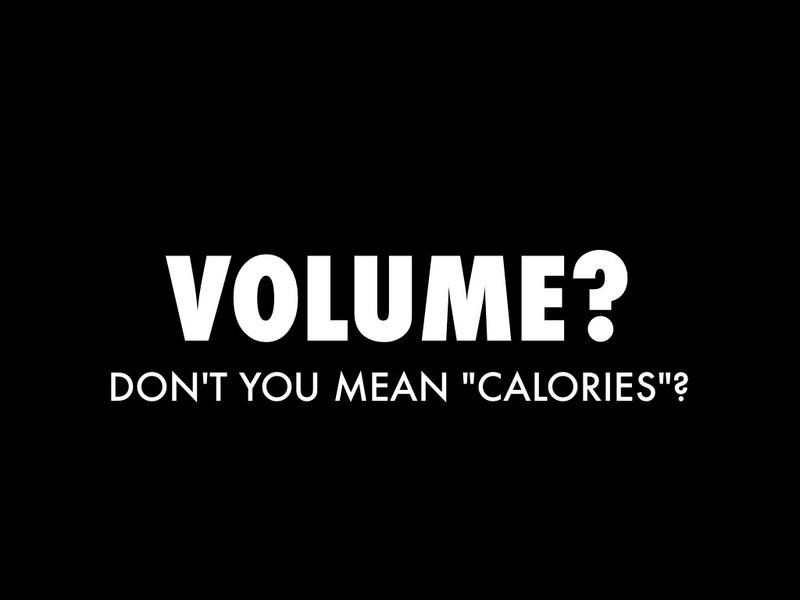 Volume is a proxy for calories. While different foods have different caloric densities (calories/unit volume), I believe that controling volume via the methd described is sufficient to induce a reduction in calorie consumption. Additionally, the ease of use of the method may make users more likely to continue its use and, thus, maintain a healthy weight for the long term. Correlates well with calories: Since [calories]=[volume]*[calories/volume]=[volume]*[caloric density], by definition, the strength of the correlation between an estimate of the volume of food eaten and an estimate of the number of calories in the food eaten will depend (given high quality estimations) primarily on the variation in the densities of the foods eaten. I have taken a measurement of this correlation and found it to be .69 (see next slide). 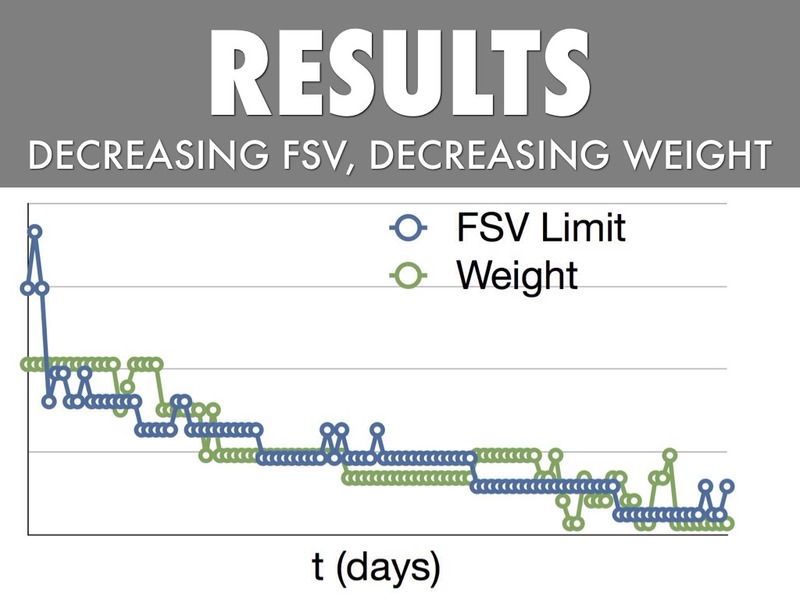 Additionally, we note this observation: If you remove one FSV from your diet you will have reduced your calorie intake by some amount, although you will not know the precise amount. Since our goal is to reduce the calorie intake -- as opposed to taking a precise measurement of calorie intake -- perhaps this is adequate. The FSV is a single estimation method for all foods: home-made food, packaged food, restaurant food, vacation food, etc. You always have your fist available, so no measuring device (ex., a scale, a calorie database) needs to be available. 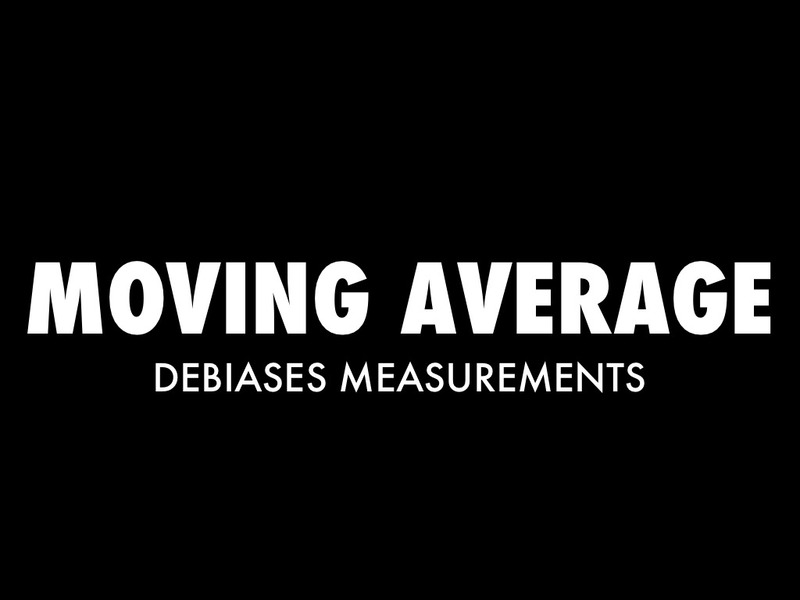 Because of the moving average the FSV measurement is robust to persistent, systematic errors and to persistent inter-user differences in fist size and interpretation of instructions. 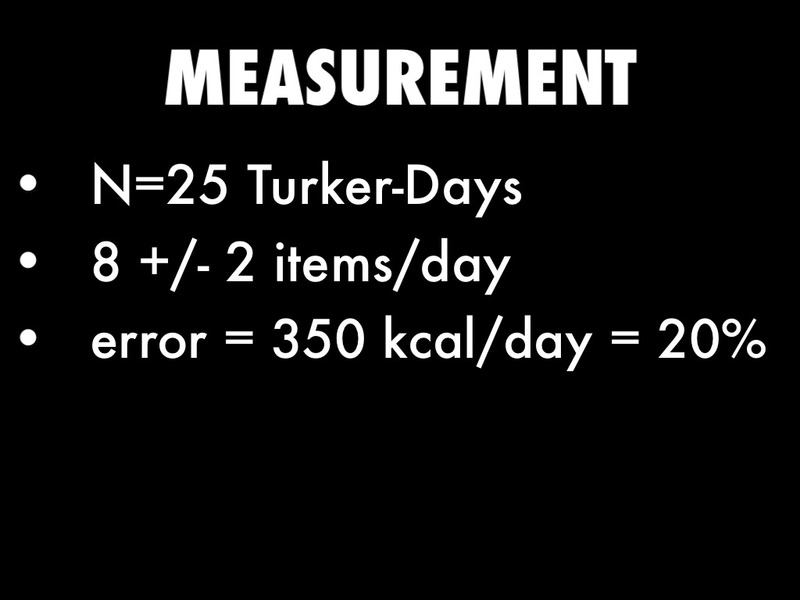 I measured the correlation between FSV and calorie estimates usung data collected from Amazon's Mechanical Turk. I asked for 25 HITs (Human Interaction Tasks). Two users ("Turkers") responded twice. Each HIT was a list of one day's worth of food items, each item's FSV, and an estimate of its calories from calorieking.com, an online calorie database. The error from using FSV instead of calorie tables (20%) was smaller than the natural variation in calories consumed (39%). 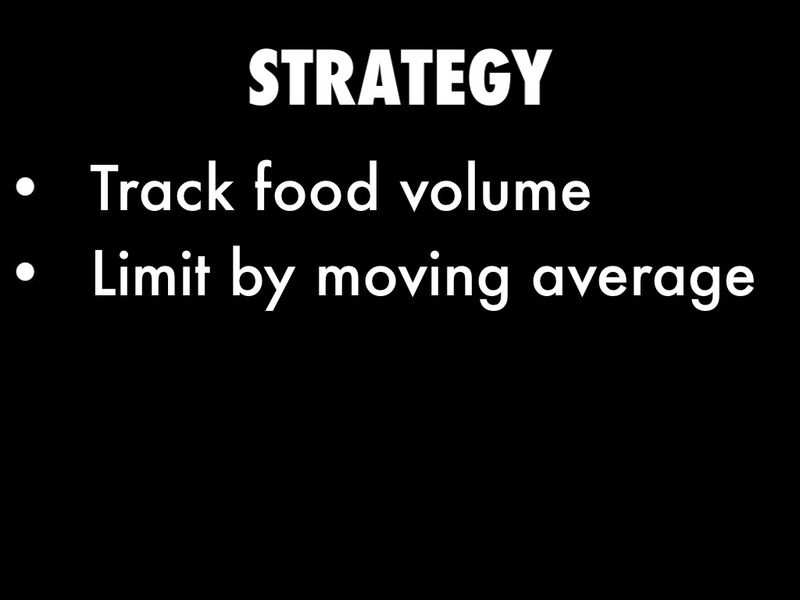 Caveat 2: We'd prefer to compare FSV estimates to actual calories consumed rather than to estimates of calories consumed. Such a measurement would have one less source of error. While a cross-sectional model/formula for estimating required calorie intake is interesting and useful, it might not be the best tool for this job. We don't actually need to compare our eating/activity to that of others to lose weight. It makes it unnecessary to enter auxiliary information like height, weight, or gender. The system just starts running. This plot shows a record of my FSV limit vs time overlaid with my wight vs time. Each of the two timeseries is centered and scaled so that we can just study their correlation. Caveat: Correlation does not imply causation.